It was a resting place for on crocodile that brought others to the Estero el Salado Protected Natural Area. Christina, one of the guides at el Salado shared that a farmer had a troublesome crock that was consuming his livestock. He hooked chicken as a trap and the crocodile took the bait, was injured, brought to the sanctuary and although they tried their best, they couldn’t save him. They buried him onsite and his smell actually brought a pregnant female to the site and she laid her eggs at the burial site. Since that time, el Salado has been not only an estuary with amazing birdlife and an endangered Mangrove swamp, but also a crocodile sanctuary as well. The estuary is set dead center in the hotel resort area, an area that once was mangrove swamp and has been cleared to create beautiful beaches and hotel fronts that beckon tourists like me and the other writers that came to Puerto Vallarta for the North American Travel Writers conference to see the history, beauty and culture of Puerto Vallarta. While tourism is a boon to the economy, it is places like el Salado that is offering a chance for natives and tourist alike to see a bit of natural habitat and preserve what so quickly has disappeared. Estero el Salado Protected Natural Area is comprised of 417 acres, of which approximately 334 acres are marshes and mangrove vegetation; the rest is made up of two medium-sized remnants of rain forest bordered by aquatic and subaquatic vegetation, prickly forest and secondary vegetation. “The mangrove swamp used to go all the way from the Sheraton to the ocean,” our guide Christina said with a hand gesture that indicates the area that although a big reserve has been diminished greatly over time. My visit to El Salado was on the heels of great dining, an art walk and a visit to the botanical gardens, this was a wonderful reminder of the native beauty of the area. 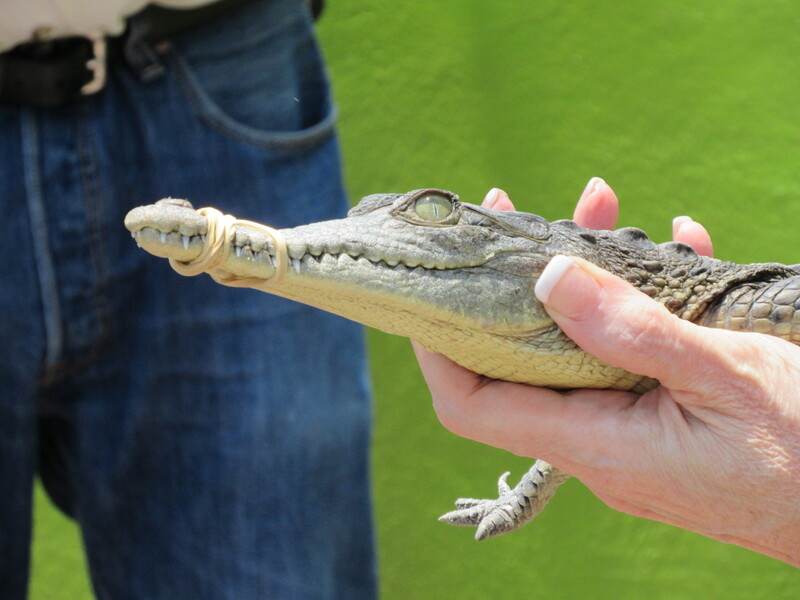 I had a chance to hold a baby crocodile (with the snout banded shut! ), take a boat ride traveling at one kilometer per hour on the “La Aventuera” down the channel to see the mangrove swamp and a very large croc hiding in the roots. I took a boardwalk to a tower that offered a view of birdlife (I saw a vulture) and a few I think Egrets. From the tower I could view the subtropical terrain with hotels dotting the distant skyline. It was a surreal moment, I won’t long forget. If in the area, consider seeing the unspoiled beauty of the El Salado by taking a tour. They offer visitors a chance to observe the great diversity of wildlife, the 3 species of mangrove and their main features. Tours are conducted Monday through Friday. Times: 9:00 a.m., 11:00 a.m., and 3:00 p.m. For more information, log onto http://visitpuertovallarta.com/event/tours-of-the-estero-el-salado-estuary.